Thanks for the great review! This has helped tip me in the direction of a Rohde & Schwarz for my new personal lab setup. They really nickel and dime buyers to get a fully loaded version. ;( With all the features unlocked, this seems like an amazing scope so please enter me in your drawing! Very good review (as always!) of a nice piece of kit. Please enter me in the draw! Nice instrument, as all are from rhode & schwartz…would make me very happy so I am applying for the draw. A very good review, as expected from you. 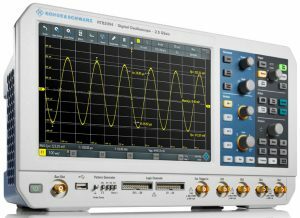 The R&S RTB2004 would be a good replacement for my intensively used Tektronix TDS724D. The Tek has no digital inputs and beginning to have more and more hick-ups. I think a recap must be done, but that takes an enormous amount of time and is expensive. So I very much would apply to the draw. Very interesting review of a powerful oscilloscope. Excellent review and such a powerfull instrument. Thinking back at the time when I started with an analog Hameg 20 MHz Oscilloscope. Oh, and yes, of course applying for the draw. Keep it up!